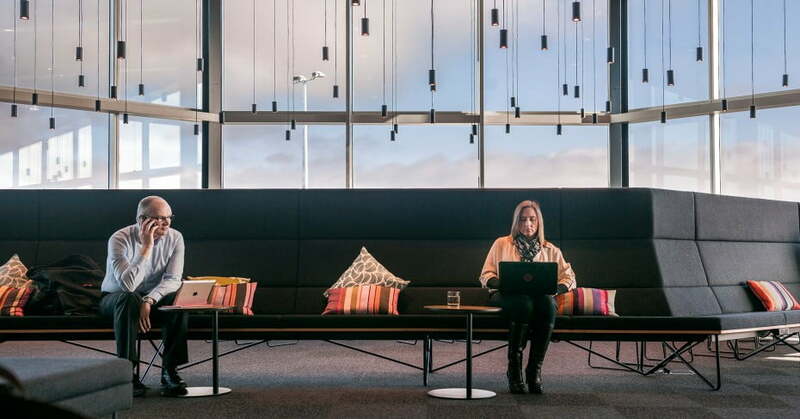 Our Air New Zealand Lounges are a great place to relax and refuel with something to eat and drink or to find a quiet space to get that last bit of work done before your flight departs. The Air New Zealand Wellington Domestic Lounge is closed whilst it undergoes construction for its comprehensive refurbishment. See details below for more information. Airpoints™ Elite, Gold, Elite Partner and Koru members departing on an Air New Zealand flight (no more than four hours prior to flight departure). Your guest must enter the lounge at the same time as you and be departing on an Air New Zealand domestic operated flight. Airpoints Elite members can bring up to five guests. Airpoints Gold, Elite Partner and Koru members can bring in one guest. Guest access is subject to space on the day. Children aged 11 years and under are permitted on a complimentary basis, subject to space availability and must be supervised at all times. Open one hour before the first flight until the last departure. Auckland Airport Domestic Terminal, first floor, near departure gate 33. 1346m2, seating for 350 guests. Buffet meals, snacks, barista coffee and bar. Wifi, business desk, photocopier, printer and phone charging station. Newspapers, magazines, TV and Kid’s room. Christchurch Domestic Lounge has floor to ceiling windows that provide excellent views of the runway. Christchurch Airport Domestic Terminal, level 2 after security screening. 800m2, seating for 244 guests. Snack buffet, barista coffee and bar. Artistic rendering of the Air New Zealand Domestic Lounge at Wellington Airport when refurbishment is complete. 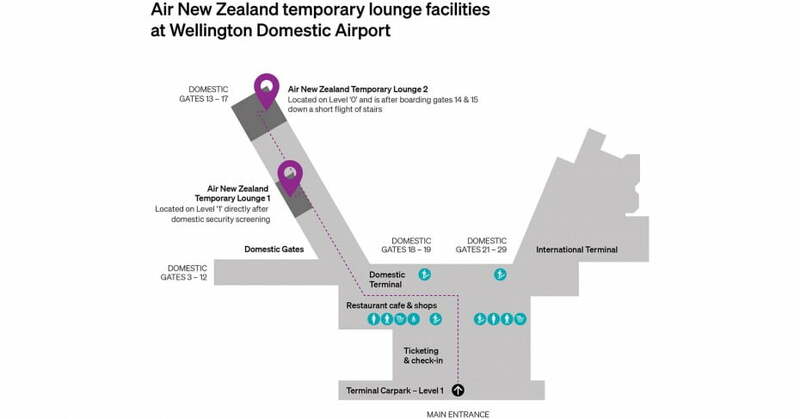 The Air New Zealand Domestic lounge at Wellington Airport closed on 26 March 2019 for construction for its comprehensive refurbishment. During this time there are two temporary lounge facilities available for members to access. These are both located after proceeding through domestic aviation security screening: on level 1, directly after domestic Avsec screening and on level 0, after boarding gates 14 & 15. The temporary lounge facilities will still feature the organic fair trade Hummingbird barista made coffee, however an adjusted menu will be offered, which includes some of the usual staple items. There are no bathrooms in these temporary spaces, however the airport's bathroom facilities are available instead. 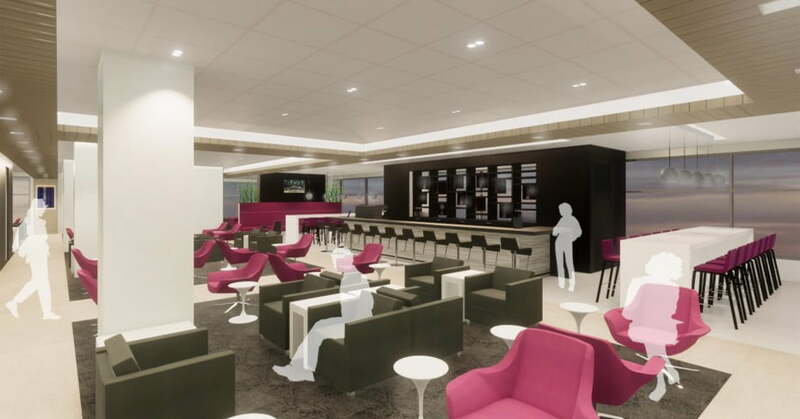 When complete, the Domestic lounge will provide 10% more seating, with six different zones to suit the needs of our members, including café, bar/barista, business and quiet areas and will be in the signature modern lounge design as seen in some of our other lounges like Tauranga, Hamilton and Dunedin. Thank you for your patience and understanding whilst this refurbishment upgrade gets underway, we look forward to welcoming our members and their guest/s into the refreshed lounge when finished. Wellington Airport Domestic Terminal, level 2 of the south western pier. 1248m2, seating for 352 guests. Wi-Fi, business desk, photocopier, printer, and phone charging station.